Say “Happy Birthday!” in a very big way with JUNIOR’S BIRTHDAY FUDGE CAKE: This decadently delicious birthday fudge cake is every chocolate lover’s birthday wish come true! Layers of moist, rich chocolate cake, chocolate ganache and sweet fudge frosting create this Junior’s® masterpiece. This gift includes fresh ingredients and requires 2-Day delivery. Serves 12. Net wt. 3 lbs. Kosher. These exceptionally fresh cheesecakes and cakes require 2-Day delivery for an additional $7.99. Say "Happy Birthday!" in a very big way with JUNIOR’S BIRTHDAY FUDGE CAKE: This decadently delicious birthday fudge cake is every chocolate lover's birthday wish come true! 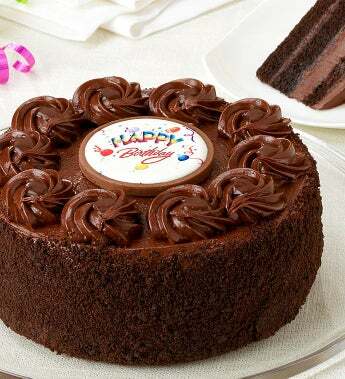 Layers of moist, rich chocolate cake, chocolate ganache and sweet fudge frosting create this Junior's® masterpiece. This gift includes fresh ingredients and requires 2-Day delivery. Serves 12. Net wt. 3 lbs. Kosher.